Hi, Today we know top ten Nokia Secret Code and how to manage your Nokia phone by Secret Code You can reset and see your IMEI number, Bluetooth, WiFi MAC address, software version by secret codes. These secret codes are working all Nokia mobile phones and make easy to handle Nokia phone for you. With these Nokia Secret Code you can troubleshoot of your Nokia phones routine problems. it’s show your IMEI number and Bluetooth, WiFi MAC address. These code are shown your mobile software version, and allows you to check the “Call Waiting” status of your phone. 1. You can check your Nokia phone IMEI (International Mobile Equipment Identity) by *#06# code. 2. you can view your Nokia phone software version by *#0000# code. 3. 12345 is default lock and a security code of Nokia phones. 4. *#7370# code is hard reset on your phone, it is deleting your personal data like contacts, messages, images etc. It is used only some critical problem in phone software. *#7780# code is soft reset your phone and it does not delete your data. Both of these codes are wiping the handset internal memory and restore phone original settings. 5. *#7760# code is used for seeing Manufactures information. 6. *#2820# code is used to display the MAC address of Bluetooth on the phone screen. 7. *#62209526# code is used to display the MAC address of Wireless LAN on the phone screen. 8. *#21# code allows you to check the number that “All Calls” are diverted to. 9. *#2640# code used for display security code on your phone screen. 10. *#43# code allows you to check the “Call Waiting” status of your phone and you can reset your phone timers and game scores by *#73# code. 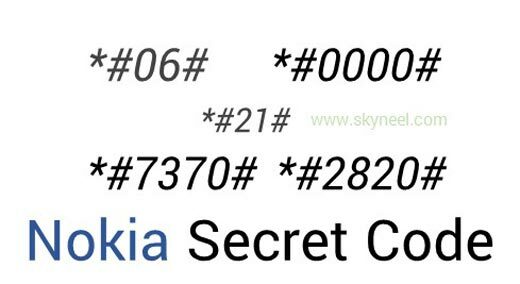 I hope you like this Nokia Secret Code from which you will be able to easily manage your Nokia phone by these Nokia Secret Code without any extra efforts. If feel any problem in this guide then please use comment box. Thanks to all.